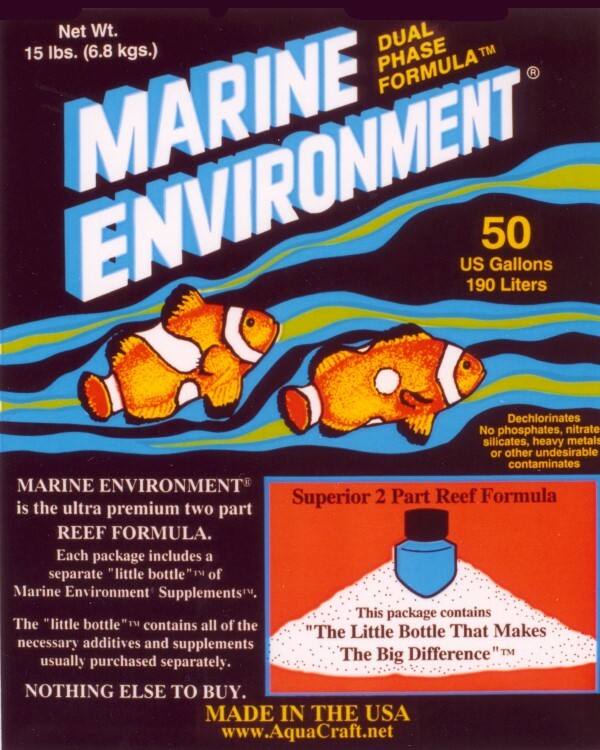 The world's FIRST and ONLY REEF FORMULA. 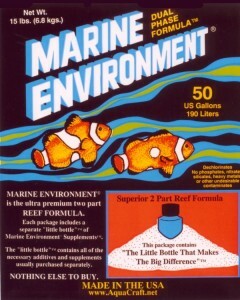 Marine Environment® dual phase formula™ is a unique 2 Part Superior true reef aquarium marine salt. Marine Environment® dual phase formula ™ mixes quickly into an optically clear, pollutant free culture medium without residue. Part #1 is a homogenous blend of all of natures 78 elements, minerals & ions. Calcium, Magnesium, Alkalinity, Strontium and other select elements are elevated over NSW levels for proven beneficial results in the close marine system. Marine Environment® dual phase formula™ as are all other Aqua Craft Products® marine salts the most consistently correct formulations available. Part #2 is a separate “Little Bottle that makes the Big Difference”™. The contents of the Little Bottle” includes Aqua Craft Products® supplementals: #6 Bio Elements™, #8 Iodide, #9 Strontium + Molybdenum™. #10 Sea Trace® & #11 Sea Safe®. Marine Environment® dual phase formula™ is available in 25 US gallon, 50 US gallon, 150 US gallon & 8000 US gallon sizes.